Well my usual how long it took and how awesome roush rant placed here. I AM NOT RESPONSIBLE FOR YOUR CRAP! IF YOU BREAK IT USING MY INSTRUCTIONS I AM NOT RESPONSIBLE! YAY! that was easy right? 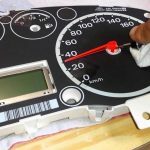 next you will need to take apart your dash to remove the old unit. a. their will be 4 bolts underneath your steering unit (where your hood release latch it) that will need to be removed. b.Once removed give it a tug on the left side (their is a little latch on that side) and it should pull out. I, personally, did not remove this peice (did not seem as a in the way) but you may remove the hood release cable and place that part of the trim away from the dash. c. their will be a bolt underneath the headlight switch which needs to be taken out. 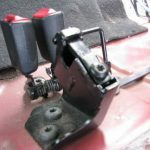 d. the dash surrounding the cluster is now ready to come out, BE CAREFULL, part of your steering column is also attached to this peice, their are two latches that come off from either side of the steering column that can be pressed to release the dash unit. g. lock up your car (if your in the ghetto like i am) go inside, and get ready to swap out the units. a. go ahead and use the clips to remove the black front piece that has the window part that seperate you from your gauges. b. use your torx and take out all the torx screws on the units (should be like 4 in the front and two in the back). c. you’ll need to remove the needles now, i found it easiest to use a fork for the stock gauges, and my fingers for the roush needles. WARNING the roush needles are fragile and will bend easily! d. remove the faces both the units. e. now for the swap we can’t just swap faces, you’ll have to take all the light bulbs out from your old cluster and put them in the roush cluster (if you intend to make the roush cluster look and work like your old cluster, for resale or back up use). f. removing these bulbs is a b!tch, my fingers hurt from it. takes some getting use to but it can be done! basically i took a flat head screw driver and poked the latches up while twisting from the other side. they popped out! g. place the bulbs into the roush unit in the same pattern you take em out. h. once the roush board has the stock bulbs inserted, you can go ahead and put them back together. Remember:theroush unit is going to now have the stock faces with the stock bulbs, the nifty EL glow system is going along with the roush faces in your existing unit. b. when putting the unit in the car i recommend leaving the window off the gauges so that you can do the needle hack (1,2) to make sure your gauges read properly. Carefull! when putting my window back on my gauges, the silver trim piece would fall off and hit my needles! then back to square one with the needle hack! 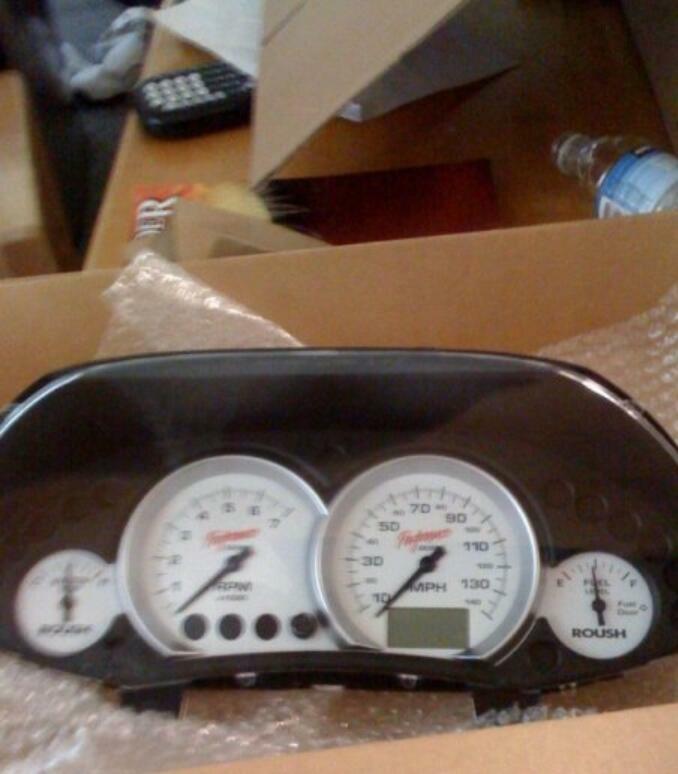 finally pulled the gauges out enough to tilt them up made it easier.